A medieval knight comes out from the frame and holds his lance at head height, aiming at his target. A giant, scary fish opens its maw as wide as it can, to swallow everything in sight. People have angelic wings sprouting from their back and look like they’ve descended from the sky, or else they sit with legs crossed in a yoga position and levitate above the floor. They are not merely onlookers, but are the heroes of the pictures. 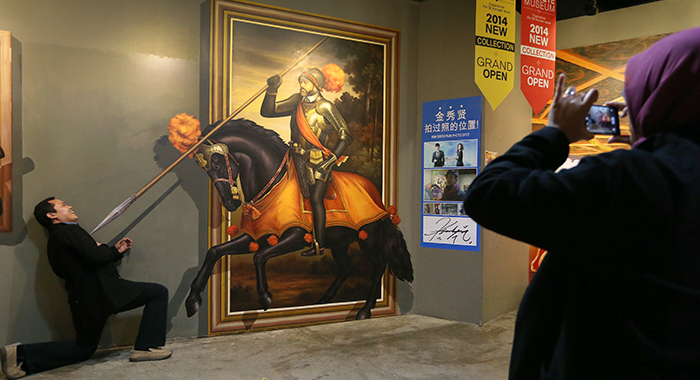 All the pictures at the Trickeye Museum, located along the broad double esplanade in the Hongdae neighborhood of Seoul, require people to take part in the painting to complete the artwork. “Trickeye” is a fabricated English word based on the French word “trompe-l’œil,” an art technique that uses realistic imagery to create an optical illusion and which depicts the objects in three dimensions. Unlike other museums or art galleries, this place has no taboos. It allows people to touch and take photos of each of the displayed works. The audience can also take part in the artwork by feeling it and communicating with it. The pictures are displayed on the wall or on the floor, to create artwork along with the audience by maximizing the 3D effect. 15,000 won/ Adults 12,000 won/ Under 18 years old. 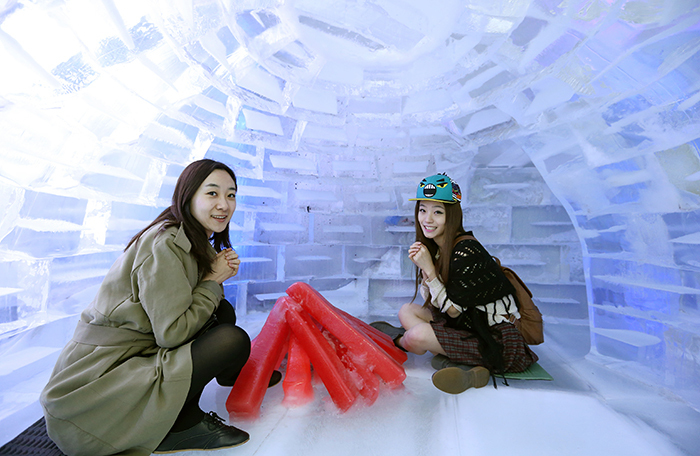 The museum has a total of eight exhibition halls, including an ice museum and a permanent exhibition hall. It shows not only well-known pictures from around the world, but also has pictures the museum created itself. In its theme-based exhibition halls, the museum recently introduced new paintings of China and of famous Dutch painter Vincent van Gogh (1853-1890). Some noticeable pictures include a scene from a famous Chinese movie featuring kung fu master Jet Li, a panda hanging from a bamboo tree, “The Starry Night” and “Terrace of a Cafe on Montmartre.” In the permanent exhibition hall, people can appreciate scenes from fantasy, adventure, travel, safari and romance movies. 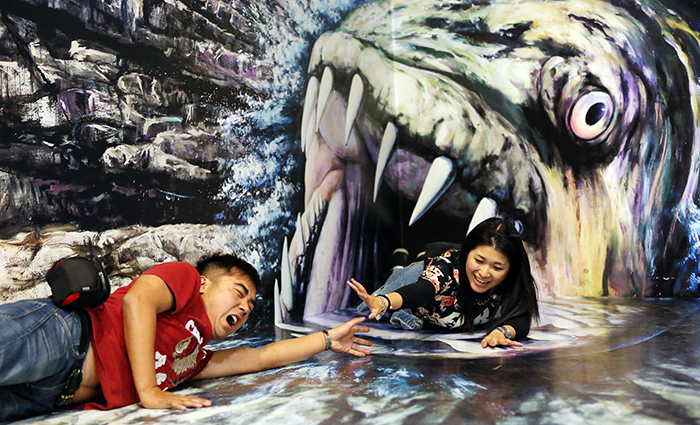 Visitors can pose for a photo in front of a giant, scary fish. 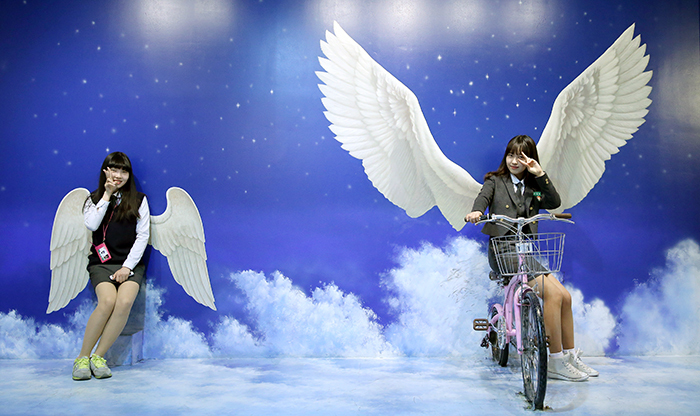 One of the most favorite pictures has sets of angelic wings against a blue wall. It attracts so many people that there’s always a long queue, waiting to take their photo there. 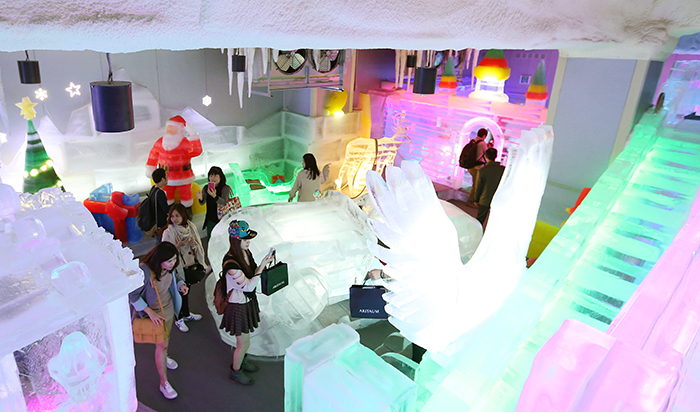 The Ice Museum is another must-see attraction at the museum. The room maintains a temperature of minus 4 Celsius. Everything inside is made with ice, including an ice TV, an ice fridge, an ice carriage, an ice slide and an igloo. Visitors are advised to bring a jacket. Cecilia Liang, who was visiting the museum from China with her friend on April 3, said she found the museum at the website “Hallyu Network” (unofficial translation), which introduces Korea to Chinese Internet users. “I like it. 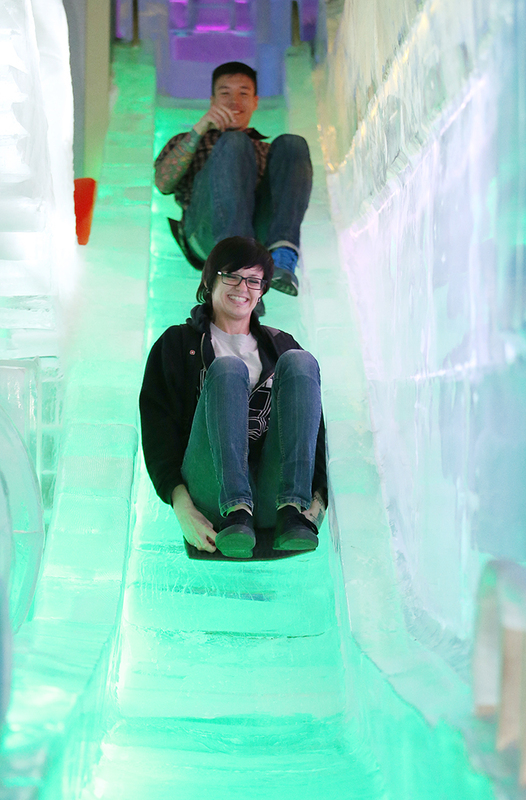 I wanted to experience something new and unique and this place is fun and nice,” she said. Since opening in 2010, the Trickeye Museum has become really popular among tourists who visit Seoul and through social networking channels. In the first quarter of 2014 alone, about 123,000 overseas tourists visited the place. Thai visitors made up the largest proportion, followed by Chinese, including those from the Mainland, Hong Kong and Taiwan. The number of visitors from Southeast Asia, such as Indonesia, is also growing these days. 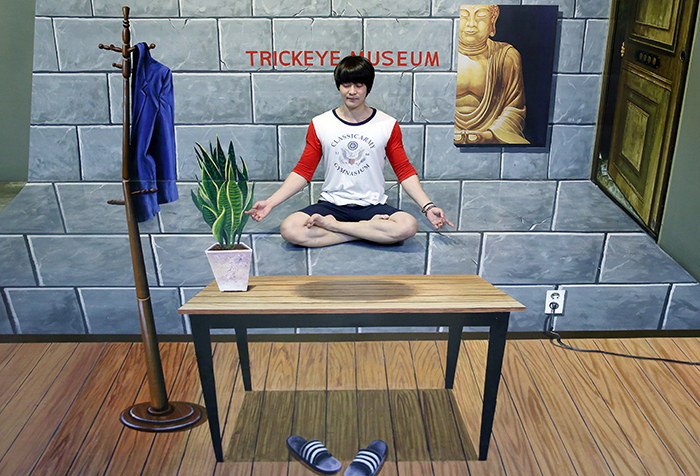 The Trickeye Museum ranked at the top of the list of the most popular museums or galleries in Korea, as announced in March by TripAdvisor, a worldwide online travel community. The National Museum of Korea and the Leeum, Samsung Museum of Art, took second and third places on the list, respectively. What is the name of the museum which displays trompe-l’œil pictures and allows people to touch and experience something new? Email arete@korea.kr and the first five people who get the right answer will each be given two free tickets to the exhibit.